The documentary film, “Down the Lynde” is now available in its entirety online for the first time. Watch the entire 1-hour, 8-minute documentary above. The movie is about Las Vegas mogul Steve Wynn’s plans to open a casino and the impact it could have on people living in an industrial neighborhood next to Boston. I created this documentary in 2014, just several months before Boston’s only casino license was granted to Wynn. 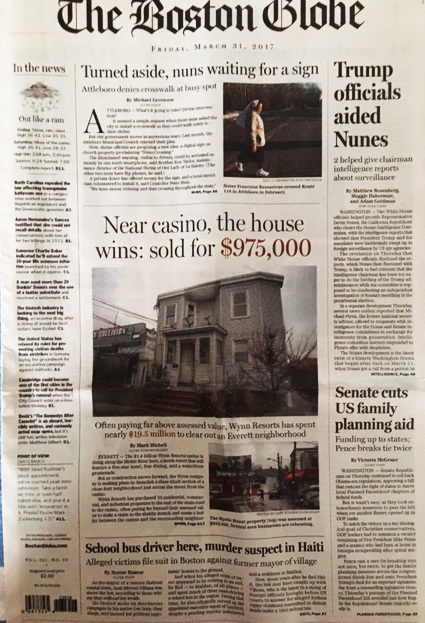 I’ve gotten to know people connected to this unique neighborhood and they give me updates on changes taking place there, some of which I documented in this front page Boston Globe article on March, 31, 2017. By reviewing city records and corporate filings I was able to confirm that Wynn is buying up properties in a 3-block area across the street from his planned casino and demolishing them to make way for new development. 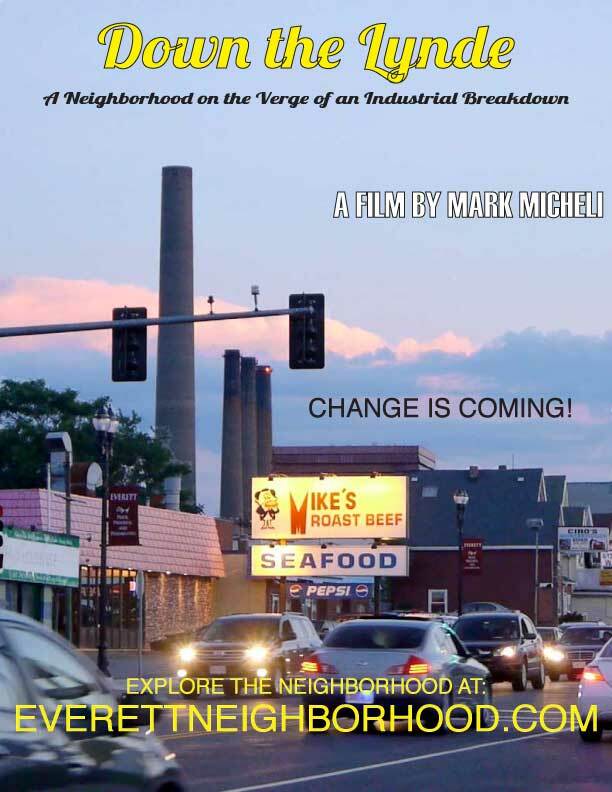 “Down the Lynde,” is a documentary film about the history of the Lynde (pronounced, “line”) neighborhood which changed from farmlands to industry in the late 19th and early 20th century and is now poised for drastic change again. The screening room at the Parlin Library was packed during the premiere on Monday, May 12, 2014. Plans to build a $2.4 billion casino in the neighborhood were approved in September, 2014 but even before that, the city of Everett had been working on an urban renewal plan for the area. The neighborhood contains a small residential neighborhood in the heart of what once was a booming industrial center. Today it is a hodgepodge of old factory buildings, single-family-, two-family-, three-family-homes, luxury condos, fast food establishments, auto shops, junk yards, produce warehouses and huge oil and gas storage tanks. Most call the neighborhood, “The Lynde”. More recently it’s been called “Lower Broadway,” particularly by people interested in marketing the location to young professionals. Change is coming: at lightning speed now that Steve Wynn’s plans to build a casino on a polluted site, where a Monsanto chemical factory was once located, were approved. This documentary premiered on Monday, May 12, 2014 to a packed screening room at the Parlin Memorial Library in Everett, Mass. 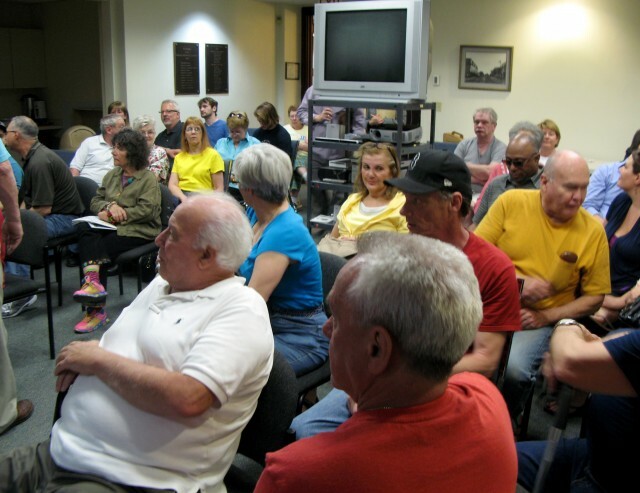 At its second screening on June 11, 2014, a standing-room-only crowd of nearly 100 watched the 68-minute movie at the Malden Public Library. Several of those who were interviewed in the documentary attended the screenings as did many former and current residents of the neighborhood. Reactions were extremely positive, a testament to the friendly nature of Everett residents. The purpose of this documentary film — my thesis project for a master’s program at Northeastern University — is to capture this unique moment in time, the turning point for a neighborhood and its people: to document their hopes and dreams for this place and to hopefully at the same time capture a universal truth: all things change. “Down the Lynde” has been shown on public access TV stations in Boston, Somerville, Everett and Malden. 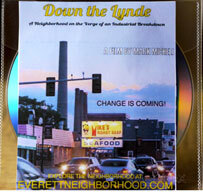 The full-length DVD of “Down the Lynde” is now available and on loan from the Everett Public Library and Malden Public Library. For more information email: markfmicheli@gmail.com . The documentary was also turned into an article for the Boston Globe which ran in the Sunday edition on May 18, 2014.